% Don't be confused by 'their' use of the term peer-to-peer (p2p): their subscribed plugin-drivers utilize existing EVSE using EVmatch's lyft/uber-style online payment method. This is not files being shared/transferred between networked peers (i.e. : torrents, etc.). Else, plugshare.com 's huge EVSE sharing base will trample& leave them reeling. (plugging in a pih with giddy-child smiles) Heather Hochrein, left, and Shannon Walker started EVMatch, which connects electric vehicle drivers with people who have charging stations. 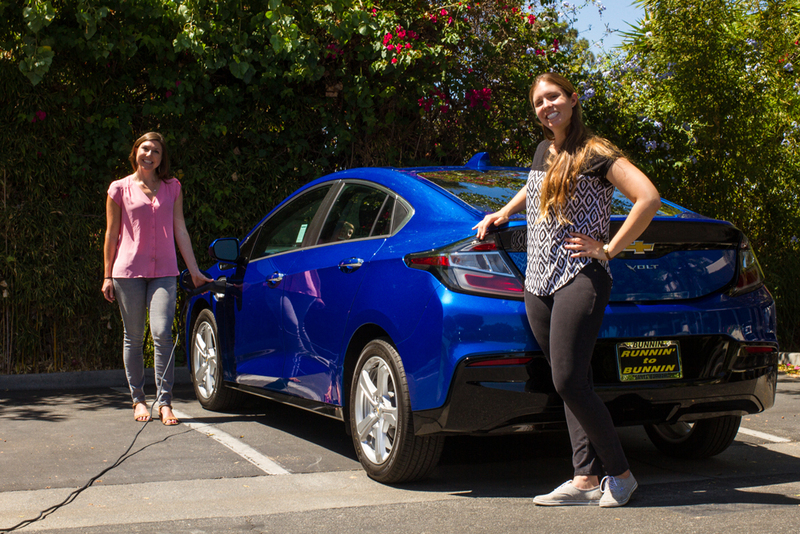 A company started by two Santa Barbara-area women that matches up electric vehicle drivers with charging stations now has registered users throughout Southern California. EVMatch was started by Heather Hochrein, its CEO, and co-founder Shannon Walker, and it was originally a master’s thesis project for the Bren School of Environmental Science and Management at UC Santa Barbara. The project focused on vehicle electrification as a way to reduce greenhouse gas emissions and local air pollution, Hochrein said. The mission of EVMatch is to utilize the sharing economy to increase the number of charging resources. Through the website, people can share access to their home charging station, set a price and designate when it’s available so other electric vehicle drivers can book a time and pay for using the station. The service was launched in the greater Los Angeles [CA] area in April and EVMatch now has stations from Goleta to San Diego. While in graduate school, Hochrein said, she and Walker conducted extensive customer research on barriers to adoption for electric vehicles. “We found that the three major barriers were lack of charging accessibility, high up-front cost and limited battery range,”​ she said, adding that auto manufacturers are addressing the range and cost considerations. “However, there’s still inadequate charging infrastructure to support widespread vehicle electrification, especially for people like renters and multiunit dwellers who don’t have access to home charging,”​ Hochrein said. EVMatch currently has 135 users registered. These are people who have registered their electric vehicles, and about half of them are charging hosts who share access to their charging stations, Hochrein said. The company will be expanding to Northern California in September and will be launching a mobile IOS app at the same time. It will be primarily in the Bay Area and Sacramento. EVMatch plans to operate predominantly in California because that’s where most of the electric vehicles are, but the company is looking at strategic expansion to other U.S. cities with high levels of electric vehicle adoption, Hochrein said. Heather Hochrein | Santa Barbara, California - ‎Co-founder and Chief Executive Officer at EVmatch ... Co-founder and CEO of EVMatch, a sharing platform for the electric vehicle (EV) community.